It’s weird- it’s like that feeling I got back in college, right after Finals Week. Every minute has been taken up with studying, or thinking you should study, or worrying that you’re not studying enough. But they you finish your last exam, and BAM! you’ve got nothing particularly important to do. It’s both very freeing and a little bit unsettling. When I have that feeling, I like to go into my closet and see what kind of yarn I have waiting for me. I’m not a huge “Stash Person.” I generally don’t go out and buy a big bag of yarn “just because.” At most, I’ll buy a skein or two of sock yarn as a splurge, but that’s about it. But, hidden deep at the bottom of a pile of yarn in the back of my closet, I found a treasure. A bag of 11 balls of Knit Picks Wool of the Andes Sport in Papaya Heather! I literally have no idea when I bought this, or what I bought it for. It must have been years ago. I almost never wear pink, and I never wear orange. I don’t know what would have possessed me to buy so much of this shade. (It really is pretty, but it’s just not a color I normally go for.) Maybe it was on sale? I’ve got 11 skeins, though. Which means I can make something cool. A sweater maybe? Or a smallish throw blanket? Or a big shawl? What do you think I should do with my surprise stash yarn? Have you ever been surprised by what you found in your stash? 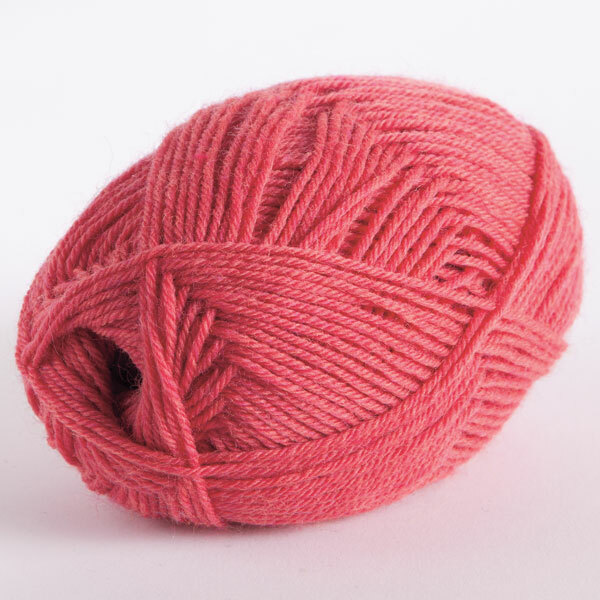 This entry was posted in On My Needles and tagged knit picks, knitpicks, papaya, pink, stash, wool of the andes sport, yarn on August 14, 2017 by onemilljellybeans. I’d opt for a sweater, a cheerful shade for the dark winter months. That is, if you think you’d wear that shade! I have an extensive stash, way too much.. sometimes I can get surprised when I open some box, but mostly I sort of know what’s there, thanks to Ravelry stash feature. Go for the throw (won’t have to worry how the color looks on you) and it would be one of those easy big things you can work on randomly with no set to ish date in mind. Or make baby blankets or newborn babies to donate. My vote is for a sweater…as was said….cheerful for winter.